Next weekend we are celebrating both girls’ summer birthdays with friends and family. Their birthdays are about a month apart – F’s is just after the 4th of July holiday, and E’s is right about the time school starts up again. This makes getting parties scheduled and out of town family in for both events a little tricky. 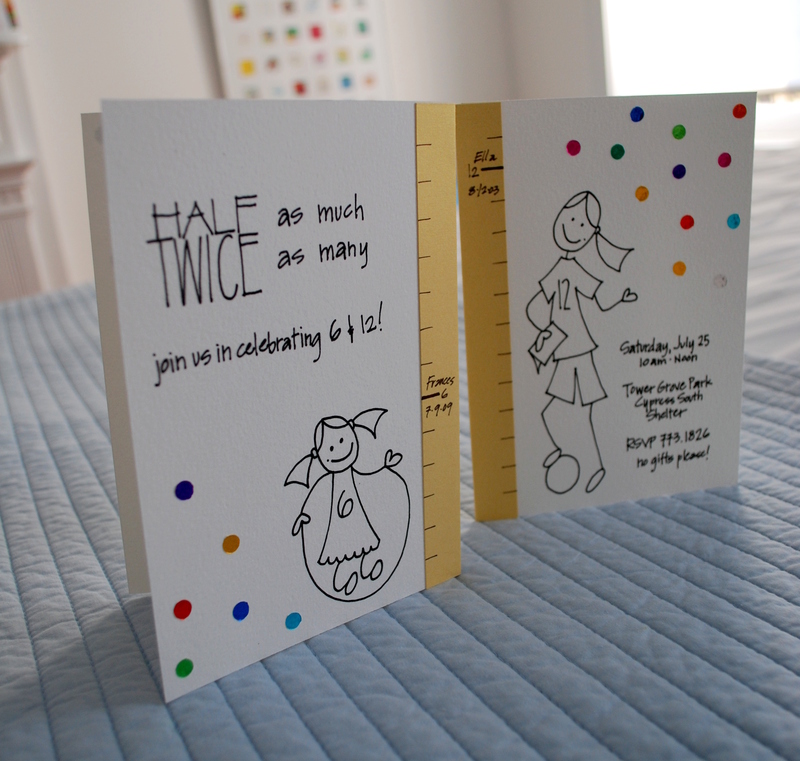 Since this year is the only year the girls will be exactly one half / twice the age of the other, we thought it might be fun to celebrate together at the halfway point between them. I had some pretty nutty ideas for party themes that no one else really rallied behind. So we’re keeping it simple, and that includes the invitation. I reversed the way you look at this card, centering it around the outside of the fold, not the inside of the folded card. 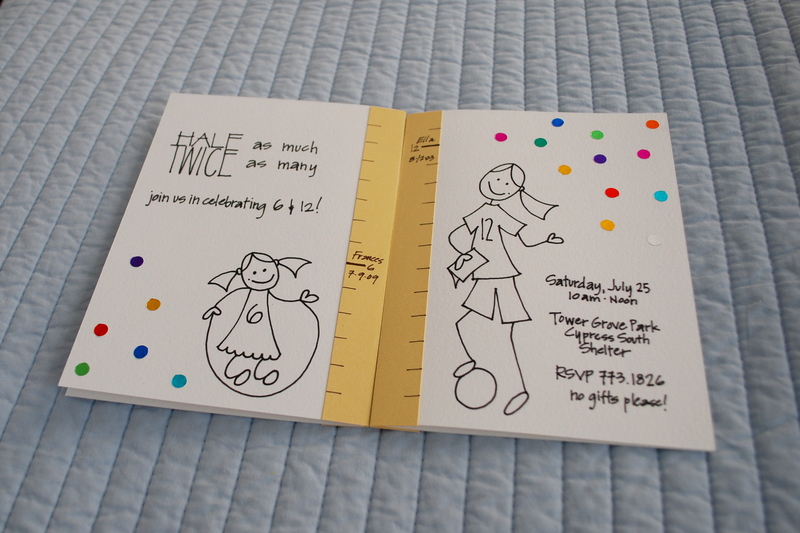 The center spine is a growth chart, and each side of the card has a line drawing of each girl. F is half as old as E, E is twice as old as F. I like the way their individual birthdays are listed on there, and I also like the added metallic dots on each side for a little color – six and twelve dots respectively. I used shimmery gold envelopes and a golden yardstick since E kept insisting that this is her “golden” birthday (she’ll turn twelve on the twelfth). I had never heard of that idea, but turns out, it’s a thing! 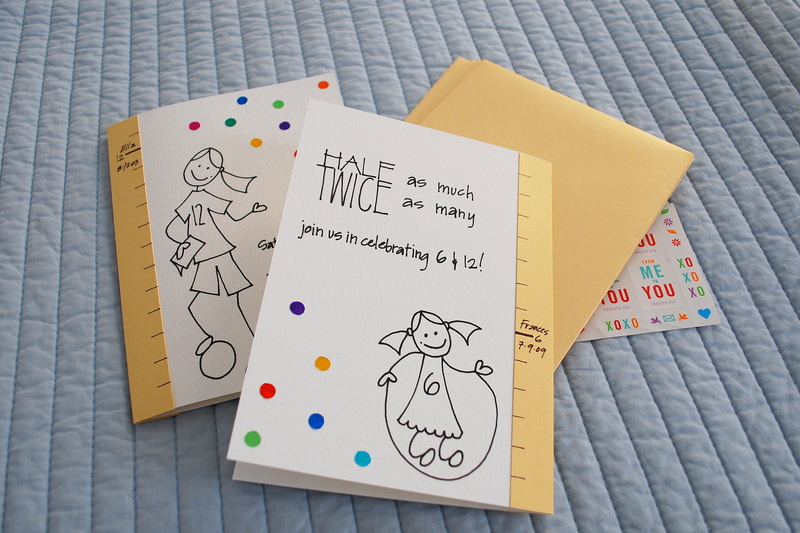 I thought these stamps were really cute with the colors and simplicity of the cards as well. This weekend will be busy with lots of planning and prep for the actual event. I’m hoping that things will fall into place, fingers crossed!